From its founding in 1960 in the back of a garage in northern Alberta, Canada, ECCO Manufacturing has evolved into one of North America’s largest manufacturers of HVAC sheetmetal products. The company employs approximately 600, who work out of a combined 500,000 sq. ft. of manufacturing and distribution space in facilities in Langley, British Columbia, Calgary, Alberta, and Kent, WA. ECCO installed its laser-cutting machine in August, 2011. The machine has a 120- by 60-in. worktable and a 6-in. z axis. Its unique architecture allows full accessibility to the working area from three sides. ECCO manufactures HVAC products—pipe, duct, boots, elbows, and fittings—for commercial and residential installations. It fabricates ferrous and nonferrous materials from 30 to 10 gauge, to create highly engineered products in rectangular, round, flat oval or other shapes. From initial estimate to completed job, it assists its customers in coordination, fabrication and shipping of everything from mass-produced quantities to custom OEM products. In 2010, the ECCO Calgary facility moved to a new manufacturing plant and distribution center, comprising 7 acres under one roof. 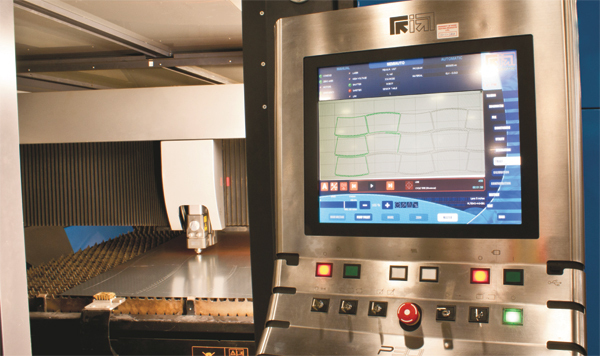 Shortly after it moved in, the plant welcomed a new fiber-laser cutting machine—a Platino 2D flat-sheet and plate processing machine from Prima Power. The laser purchase culminated a long and thoughtful equipment-decision process, says David Mackay, assistant plant manager. ECCO finds that the accuracy and the small cut width of the fiber-laser beam is so fine that it’s been able to be more creative in how it designs its products, including the use of tabs. And, being able to round the corners of the tabs means that installers have less chance of cutting themselves. 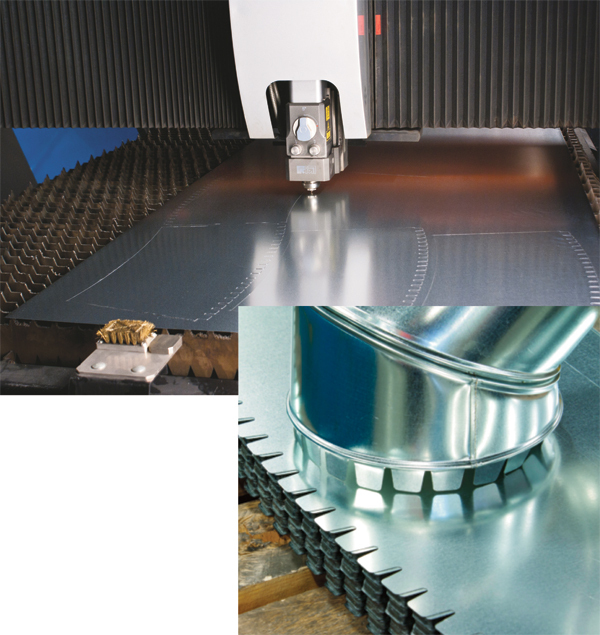 ECCO installed its laser-cutting machine in August, 2011. The machine has a 120- by 60-in. worktable and a 6-in. z axis, and its unique architecture allows full accessibility to the working area from three sides. Further, its optical setup allows cutting all materials and thicknesses with one lens, so that production changes can be made without interruptions for lens changes. The Platino’s pallet changer enables ECCO to swap out sheets in 20 or 30 sec., “significantly quicker than with other systems,” says Mackay, noting that the quick changeover maximizes beam-on time and reduces idle time. “We also like the basic drive system of the machine,” adds Mackay. “And, Prima Power has a service technician in the Alberta area, which no other supplier has. The machine has been operating well, with cutting speed from 1200 to 1500 in./min. And while we’re not primarily a precision manufacturer, the small cut width of the beam is so fine that we’ve been able to be more creative in how we design our products, including the use of tabs and the ability to add inside features. Other benefits noted by Mackay: improved material utilization, faster assembly and superior part quality. “The ability to add value-added features, such as rounding the corners on tabs, means that installers have less chance of cutting themselves,” he says. ECCO equipped its Platino machine with an automatic pallet changer, featuring automatic speed adjustment based on sheet weight, and drawers for efficient scrap collection. Mackay notes particular appreciation for the setup’s efficient pallet swap time. Article provided by Prima Power North America, Arlington Heights, IL: 847/952-6550, www.prima-na.com. Great machine. It was at Fabtech in Chicago 2011.